Growing up in the 80s, I avoided reading a Stephen King novel until around Thanksgiving Break of 1987. For some reason I had no interest. This was only compounded by the release of King’s first directorial debut called Maximum Overdrive. I just couldn’t get behind a movie about machines taking out their murderous impulses on humans even if the antagonist was a semi w/ a giant Green Goblin head on the front. Thanksgiving Break gave me a lot of time to kill and I spent most of my time wishing I was anywhere else but up in the mountains. The upcoming 7 hour drive from Young Harris to Savannah was also not thrilling me. Over the years I’d learned to stock up on reading materials to pass the time. I selected Christine. King was the second author that I read to have a serious influence on me and that I had to read everything he had written. Pat Conroy would be the first. Odd bedfellows at first glance. Over the years, I have come to realize why I dig this guy so much. The fact King can scare me and is the Master of Horror is just a bonus. What I enjoy is how he creates real characters. Trashcan Man (“Ciabola, my life for you.”) was as terrifying to me as Jack Torrence when he loses it and stalks his family through the Overlook hotel in The Shining. 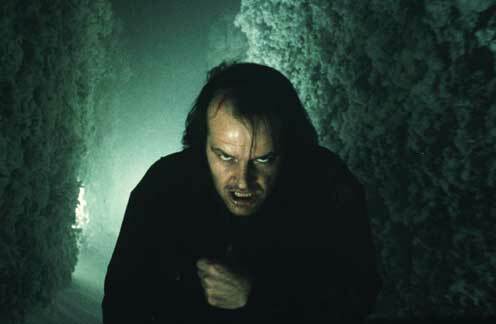 While both characters are scary because they are so twisted, I can still find ounces of humanity in them which makes their path to madness all the more terrifying. Happy Father's Day? We're good, right, Jack? Jack? The Gunslinger, The Stand, and The Talisman becoming favorites that I had to purchase my own copies. Trips to Savannah, working at summer camps, hiking in the mountains, a copy of a King novel would be my constant companion. I even got to the point where I began to read his books in order to watch how King’s writing style would evolve. 1989 brought me back surgery and six weeks of bed rest. I would finally catch up with King’s massive backlog of novels. Though, I’ll never recommend reading Misery and Gerald’s Game while on restricted bed rest. Gerald’s Game got me worked up that I still shudder when I imagine Jessie Burlingham hearing the Spaceman yell, “You’re not real, you’re made of moonlight.” Ugggh. So I am sitting here in my favorite stolen chair, doing a dialysis treatment, and chomping at the bit. 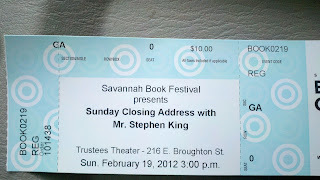 In a few hours, I get to hear Stephen King doing the closing ceremony at the Savannah Book Festival. 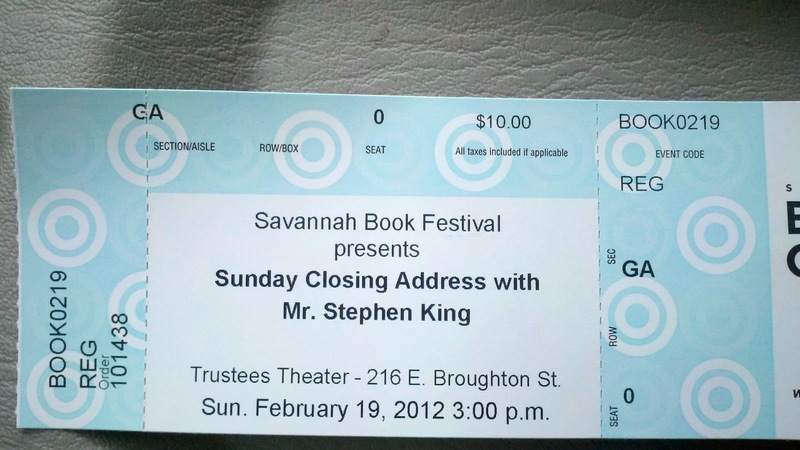 It’s rainy, a long line awaits, and I’ll have to deal with those old ladies from the Savannah Gardening club as ushers. But it’s Stephen King! The best present from the best g/f --fiance' ever. A new check can be made in my Bucket List today because I got to hear my favorite storyteller do what he does best. Talk about writing. Even better is that my talented and gorgeous fiancé is actually meeting King in a secret location with some fellow SCAD writing students to discuss the art of their craft. So proud and so jealous. Kim keeps asking me what I am going to ask King if I get the chance to. I have no idea. Gonna wing it. I’m just thrilled that I have the chance to get my copy of The Gunslinger signed that Mom & Dad purchased out at the old Sam’s Club on the Chatham Highway back in 1988. I doubt this will come as shock but I have my own dreams about writing my own great American novel. I plan on taking notes on my little moleskin pad Mary gave me and I’ll even twitter a bit if you want to check me out @ lamoais. I have no idea what to expect and even trying to keep my expectations down a little bit but I know me. If I can barely contain myself now, I am going to be stoked the minute I step into line on Broughton Street. Of course I may not make it in. ThinkGeek.com always posts nerdy pictures with their mascot, Timmy. I have already warned Kim that I plan on doing my best to get Timmy to be part of the book festival. Not sure how this will go over but I am sucker for well placed product placement.